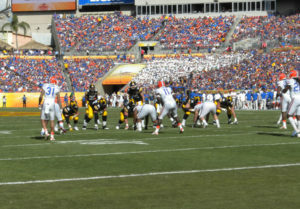 Iowa on offense in the Outback Bowl. The University of Iowa announced today that Greg Davis is retiring after five years as the offensive coordinator of the Hawkeye football team. Davis also served as the quarterbacks coach for Iowa. His retirement ends a 43-year career in the college football coaching ranks. Davis joined the Iowa coaching staff replacing Ken O’Keefe after serving as offensive coordinator at the University of Texas for 13 seasons. He was named Frank Broyles Assistant Coach of the Year in 2005 after Texas won the BCS national championship, and was a finalist for the award in 1999. Davis coached in 22 bowl games, including January bowl games (Outback twice, TaxSlayer and Rose) with the Hawkeyes the past four seasons. Greg Davis at media day 2016. With Davis on staff, the Hawkeyes won 39 games over the past five seasons, including a combined 20 wins over the past two years. 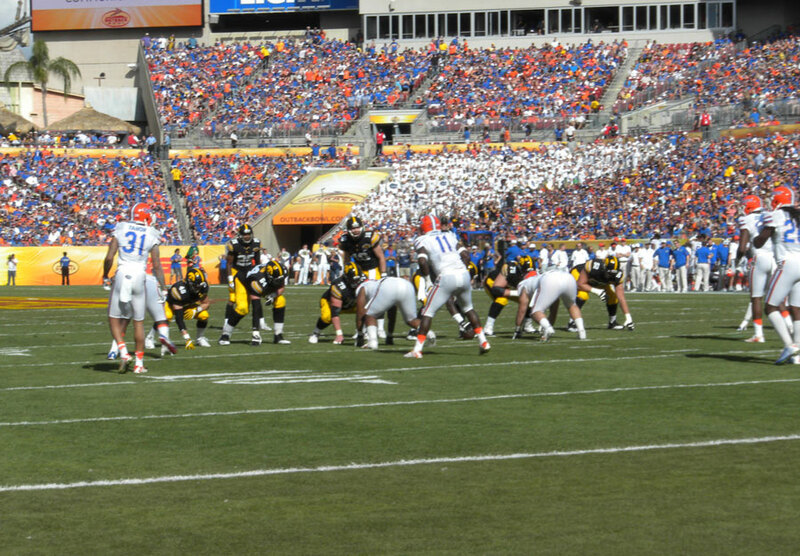 The Hawkeyes appeared in four January bowl games, including the 2016 Rose Bowl Game. The Hawkeyes won the Big Ten’s West Division in 2015 while posting a school-record 12 wins. Davis also released a statement in his retirement announcement: “I have had a wonderful five years with the Hawkeye football program. 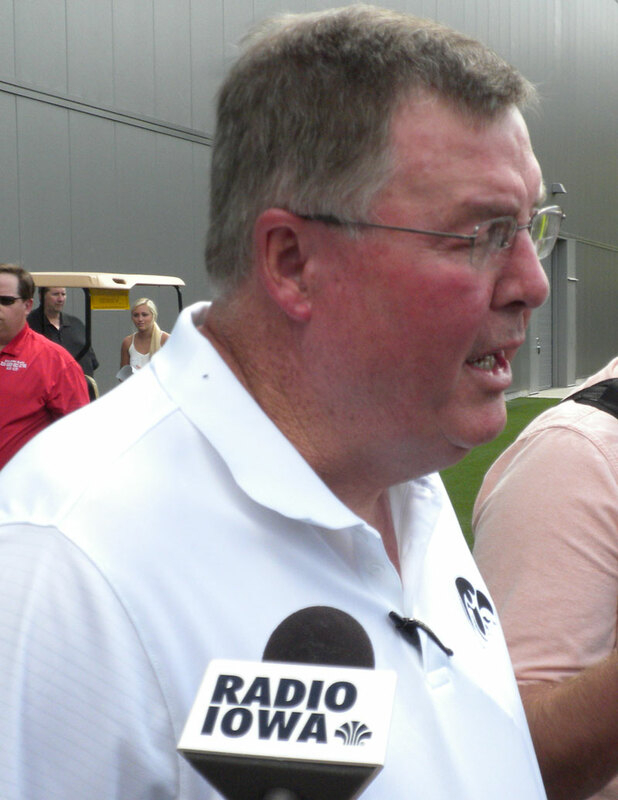 I would like to thank coach Ferentz, the entire staff, our players, and Iowa fans everywhere,” said Davis. Prior to his stint at Texas, Davis was the offensive coordinator and quarterbacks coach at North Carolina (1996-97), where he helped develop the quarterback duo of Chris Keldorf and Oscar Davenport, who teamed to complete 60 percent of their passes for more than 2,700 yards each season. Davis was head coach at Tulane for four seasons (1988-91) after serving as assistant head coach and wide receivers coach there for three seasons. Davis spent two seasons (1992-93) as offensive coordinator and quarterbacks coach at Arkansas and two years (1994-95) as Georgia’s passing game coordinator, helping the Bulldogs to the 1995 Peach Bowl. Davis began his college coaching career at Texas A&M, serving as the Aggies’ quarterbacks coach (1978-84) before moving to Tulane. Davis began his career in the high school ranks while working toward a master’s degree. He coached at Barbe High School (Lake Charles, Louisiana) from 1973-74 and Port Neches-Groves High School (Port Neches, Texas) from 1975-77, where he helped the Indians to the 1975 Texas 4A state title. Davis is a native of Groves, Texas. He earned a bachelor’s degree (sports administration, 1973) and master’s degree (1977) from McNeese State. Coach Ferentz will meet with the media on Monday in a news conference to wrap up the past season, which ended with the January 2nd loss to Florida 30-3 in the Outback Bowl.